Sweet, nutty, and earthy, these Lavender Coconut Tigernut Flour Cookies are an alluring and delicious treat to bake! 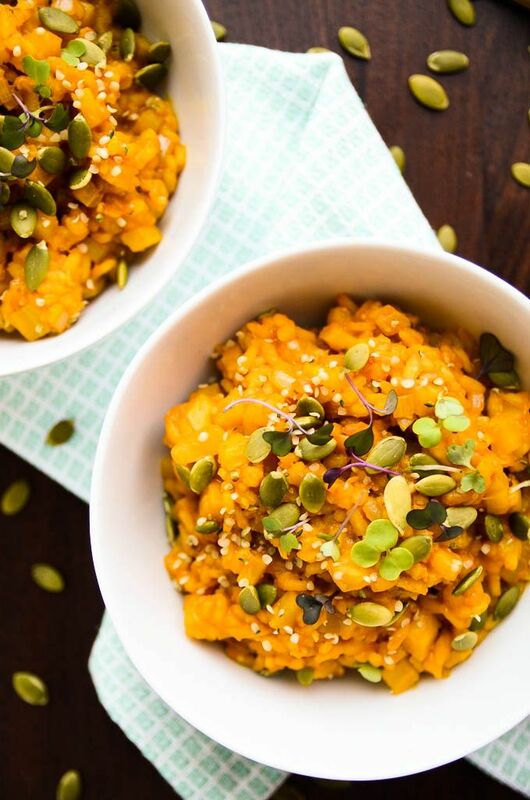 Gluten-free, vegan, paleo, and allergy-free, whether you enjoy them as a snack with afternoon tea or a healthy dessert, this recipe is bound to be a new favorite! Don’t expect much activity from me today in the blog/social media world. Why? Because this girl is NJ-bound! A day earlier then expected and I am sorta-kinda-totally pumped! This feels a bit surreal as well. My one roommate and I were talking about how “weird” it feels and how many crazy emotions have been running through our minds this past week. It feels like we just stepped foot on campus and DC. She said the smell of the stairwell was giving her major flashback to the first night we stayed here. I totally relate. This whole week felt like the first week again. Everything seemed so new and I like I was noticing everything for the first time. It may also have to do with the fact that we had tons of hours to fill and the sun has been shining, awakening everyone again from those long cold winter months when we just wanted to crawl back in bed and wait for summer. Everything just feels “weird” right now. That’s the only word to describe it. Nothing seems normal in my life right now. This past week I spent many hours in Starbucks. Blogging, thinking, studying, and drinking….a lot of coffee and tea! But I’ve felt like I’m just floating. I don’t feel grounded, but loose and free falling. I’m not sure if it’s good or bad, but we’ll see once I get settled back in NJ. For now, I hope you are feeling grounded, loved, and happy where ever you are! Here’s to a super sunshiney weekend and a BEAUTIFUL Mother’s Day on Sunday! I’m so excited to be able to spend it with my momma! I know seeing my face will be the greatest gift to her 😉 Haha! And I hope to cook her a fancy dinner like last year! Happy Friday friends! Amen! They’re only “flaws” if you call them that. The only thing that matters is what you think of yourself. Wonderful ways to implement some help! Yes, and we need to focus on and do the important things. We have to accept that things are always changing and we must do only what we can do. I adore all of these! Really, these are great! Love all of these, just in forearm stand instead! Those cringe-educing article about how many calories “this many burpees” will burn off! + Vitamix, Blentec, And Breville: Which Is Right For You? + What Weird Food Was Your Mom Eating? Haha, I love this! Childhood memories of what mom would make! It’s okay if you make the switch back. Just do what’s right for you. Seriously, dairy is the easiest thing to change out! Get the list and stock up on the goods! Hahaha! Omg! I love this “quiz”! Yes! “Dieting” does not work! Have you ever heard of this disease?! This could explain some common ailments! You’re not helping by saying these things. I’m glad my blog name will always be relevant, but social handles are different though. Living life is the most important thing you can do. This is mapped out great! Super simple to set some new goals! Great prompts for really going deep. For all you “nicheless” bloggers, you may want to rethink that. Some great plugins you may want to think of using. I think I’m going to start painting this summer! I Love coloring! It can be so relaxing for sure! when you need mass overhaul during a transitional time. Okay….this is like exactly true! 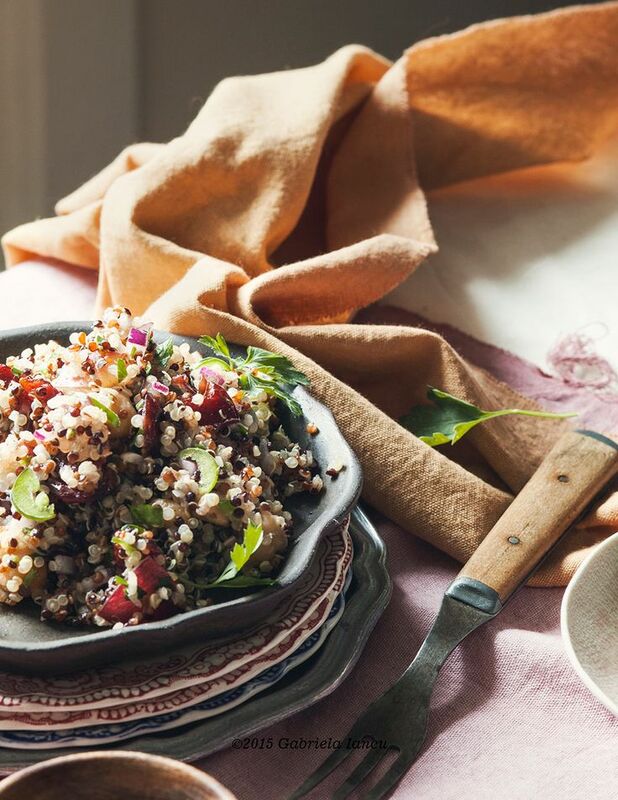 Quinoa and Grape Salad. 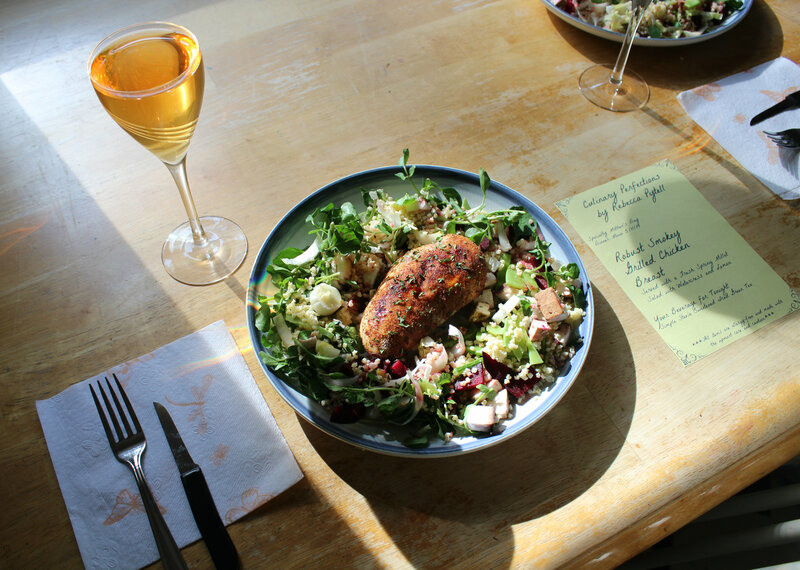 Doesn’t this look divine? Perfect for Mother’s Day too! 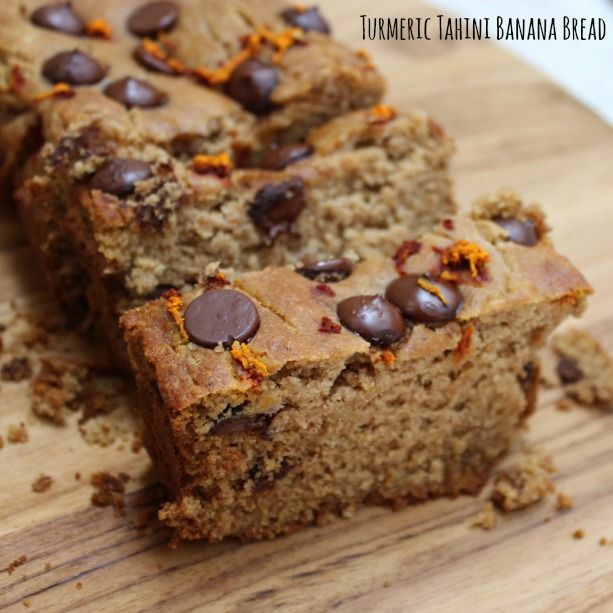 Turmeric Tahini Banana Bread. The greatest banana bread I’ve ever seen! Vegan Chocolate Waffle Cookies. 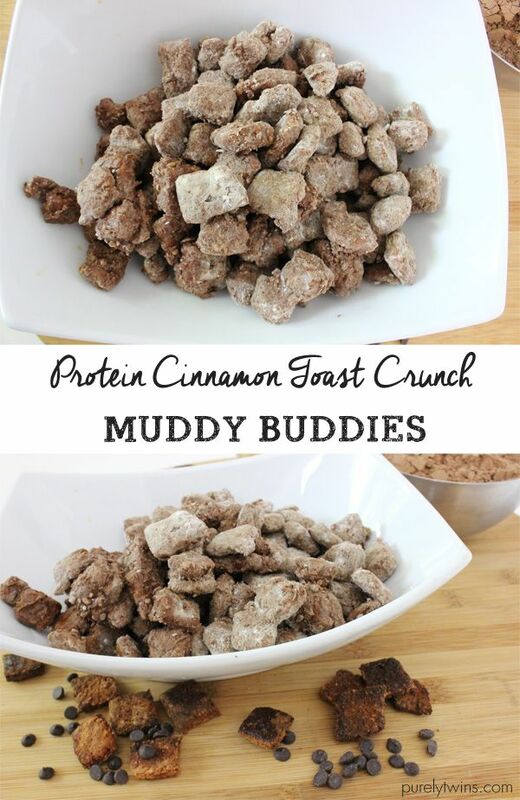 You could easily make these GF and then…perfection! 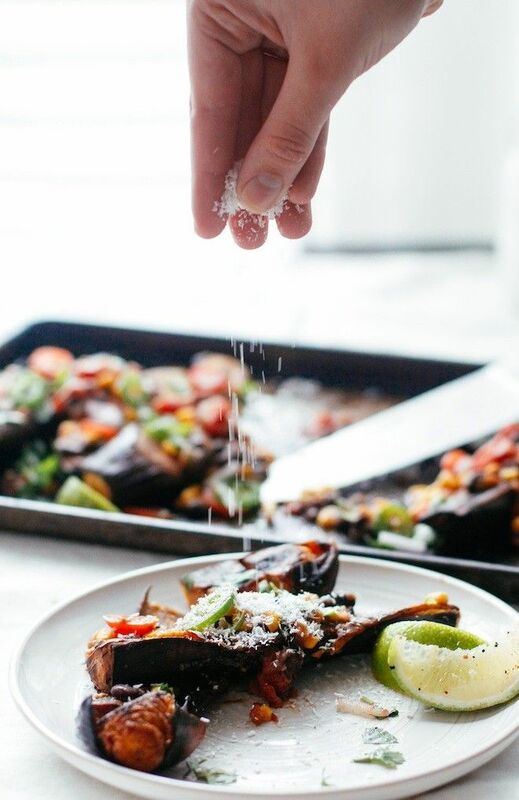 Caribbean Plantain & Bean Boats. Stuffed plantains!? Omg!!!! 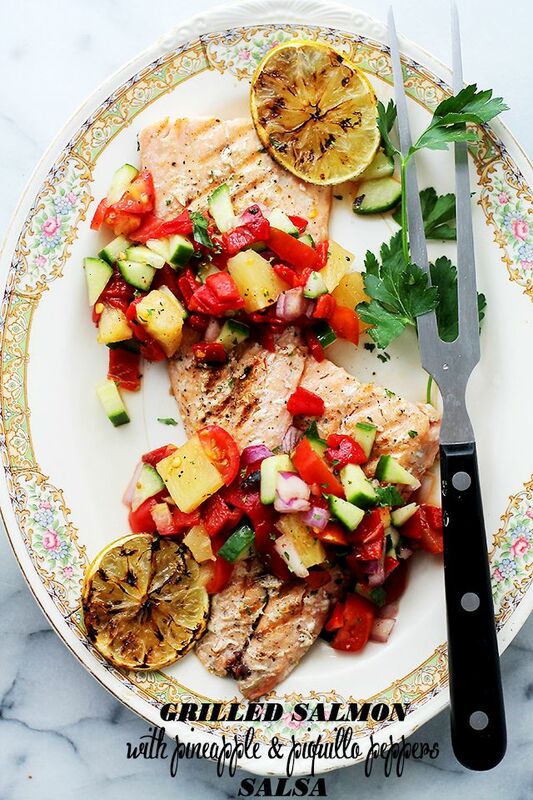 Grilled Salmon with Pineapple and Piquillo Peppers Salsa. 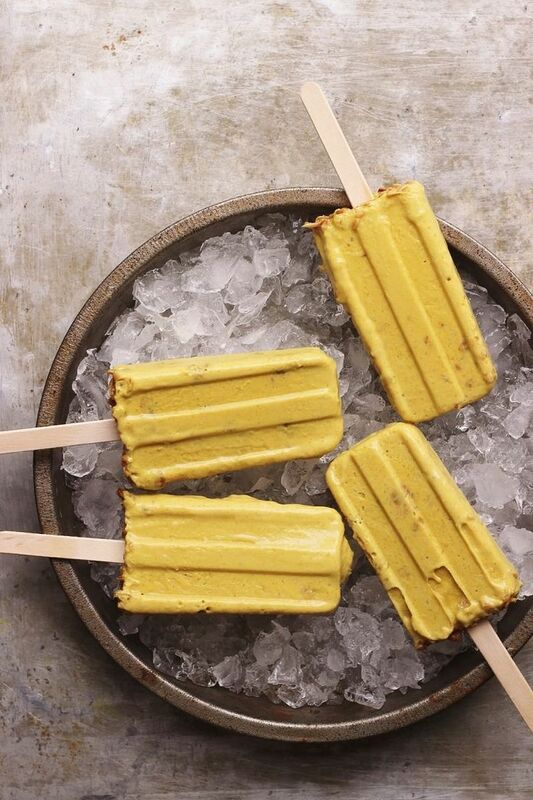 This just screams “fancy Summer bbq”! 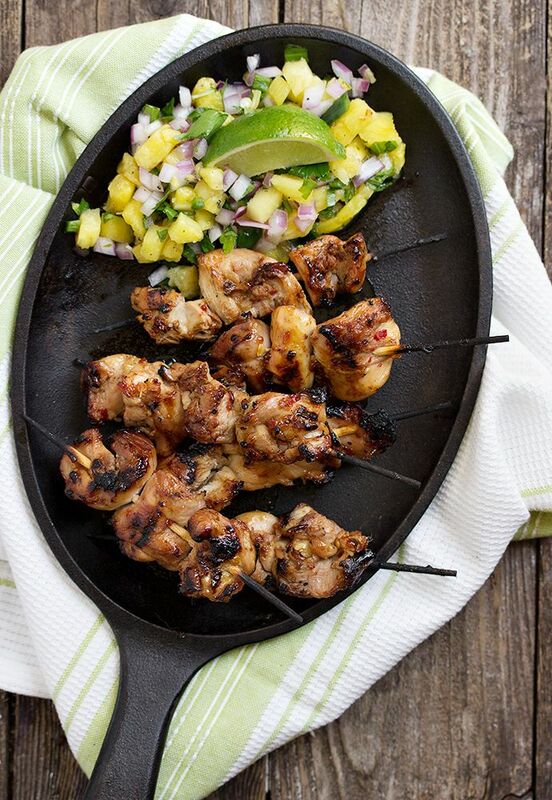 Spicy Chicken Skewers with Grilled Pineapple Salsa. Or if you don’t want salmon, have this awesome chicken! 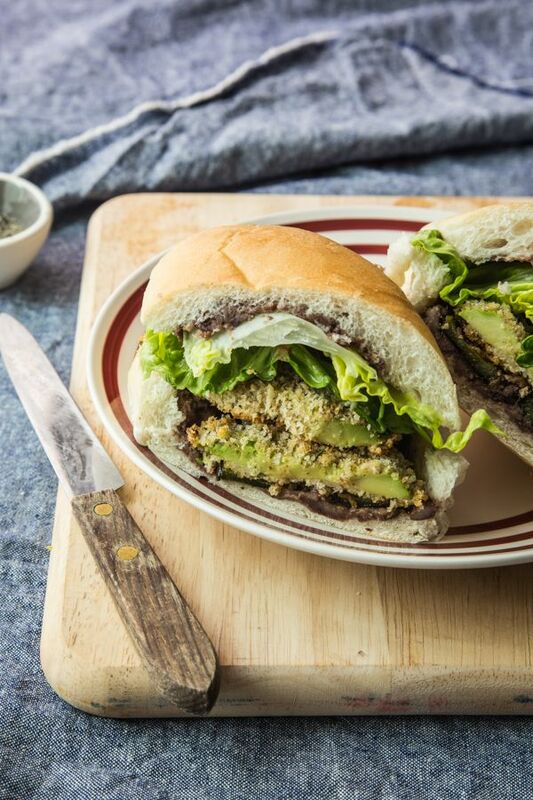 Crispy Baked Avocado Tortas. 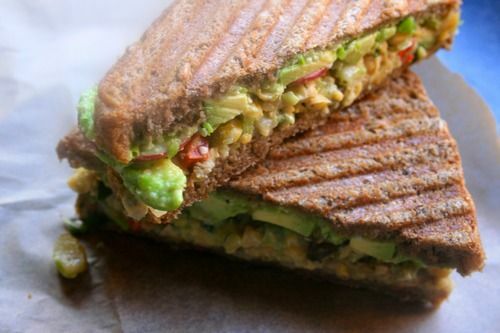 This is pure avocado love! 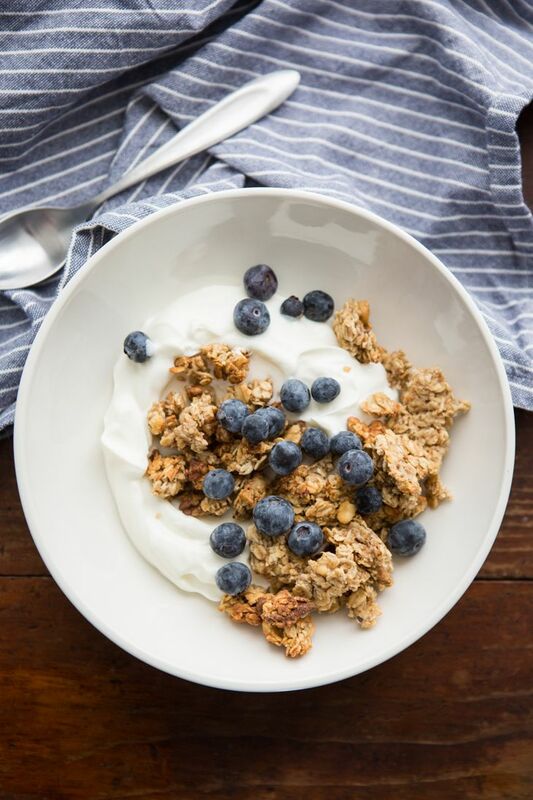 Banana Walnut Granola. It’s just so simple and beautiful! Look at those clusters! + Getting to see my family in T-minus a few hours!!!! 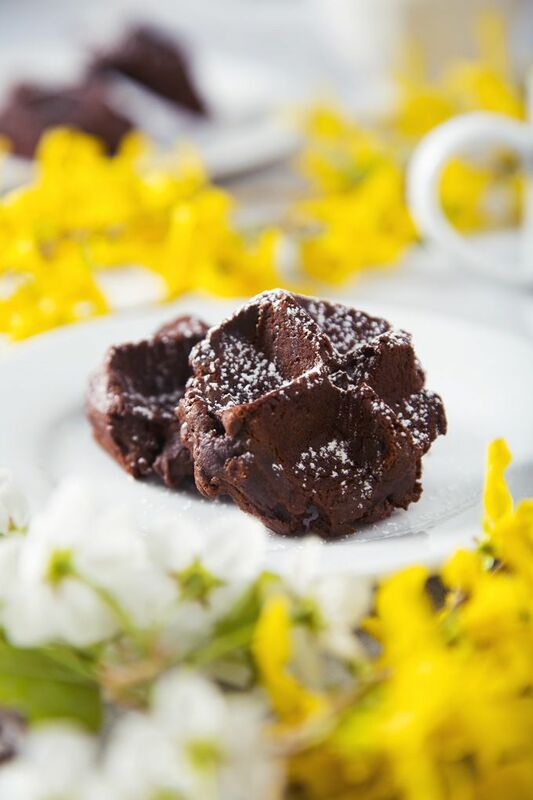 + Are you planning any fun Mother’s Day outings, dinners, brunches, events? + Do you know the “floating” feeling I’m talking about? How did you re-ground yourself again? I think it’s just because I’m in the huge transition again. Transitions/change always seem to cause that free-fall feeling. Gluten is a protein found in wheat (durum, emmer, spelt, farina, farro, Kamut khorasan wheat and einkorn), rye, barley and triticale, as well as all other derivatives of these cereal grains. Gluten helps foods maintain their shape, acting as a glue that holds food together. It is an autoimmune disease of the digestive track. When the protein, gluten, is ingested, it damages the villi in the small intestine, thus interfering with the adsorption of nutrients from food. The body essentially attacks itself when gluten enters the body. 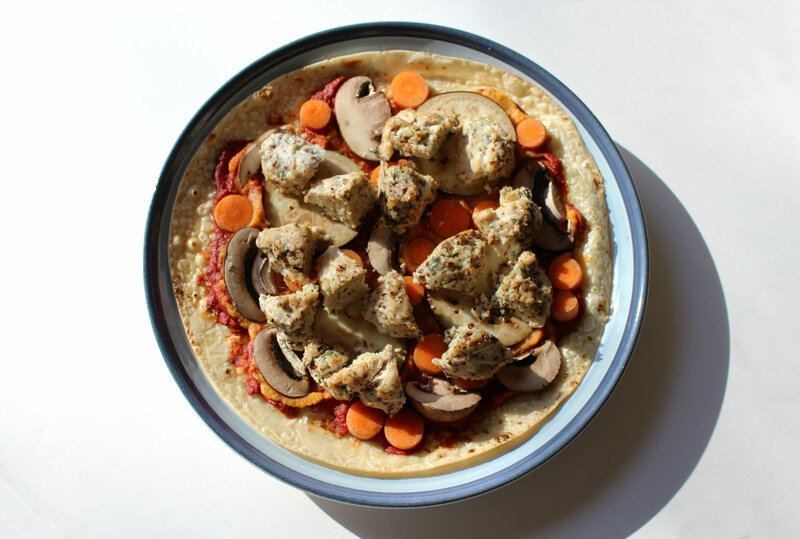 When gluten is continually ingested (before diagnosis) the villi become so damaged, the small intestine so inflamed, that your body begins to breakdown because it is becoming malnourished since nutrients are unable to be absorbed into the bloodstream. Diagnosis is so important because when left untreated, the body can develop more autoimmune diseases, severe nutrient deficiencies, anemia, osteoporosis, infertility, thyroid disorders, cancer, and even death. This can be the tricky part as some people never experience any direct symptoms that they can relate to a digestive problem. Let me explain. Children are more likely to be the ones to experience severe digestive issues but adults can also experience these including: abdominal pain and bloating, gas, distended abdomen, chronic diarrhea, vomiting, constipation, or oily/foul-smelling/fatty stool. Other symptoms include: fatigue, weight loss, irritability, discolored teeth or dental problems, delayed growth or puberty (failure to thrive), anemia, bone/joint pain, arthritis, bone loss/osteoporosis, depression or anxiety, tingling numbness in hands or feet, seizures and migraines, loss of menstrual cycle, infertility, miscarriages, canker sores inside the mouth, an itchy skin rash called dermatitis herpetiformis. However, some people can go for years without any severe symptoms, maybe they just get some bad headaches, but they would never think they have a severe autoimmune disorder. Celiac Disease is not restricted to gender, age, or race. But some people will be at greater rick due to these factors. Being a 1st or 2nd degree relative with someone who has Celiac. Celiac is a genetic based disease so if someone in you family is diagnosed, your risk is increased. 10% of family members will develop the condition. Having the HLA-DQ2 and DQ8 genes puts you at risk. 95% of those with Celiac have the HLA-DQ2 gene and the others will have the DQ8. Having other autoimmune disorders puts you at risk for developing others. 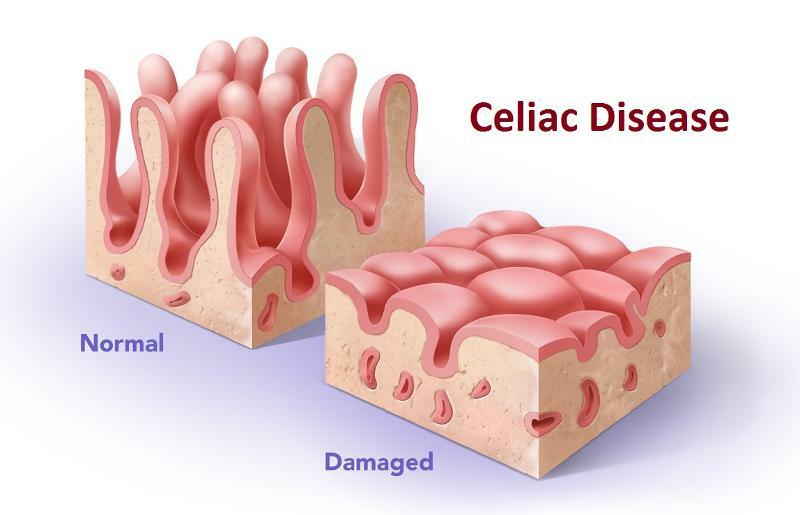 If you currently have an autoimmune disorder, you are more likely to develop Celiac. Remember in elementary school when you are sitting at your table coloring a picture and the girl to your left picks up the same crayon that you just put down. She then proceeds to copy the exact picture you have in front of yourself. You can’t even tell whose is whose, they are so similar. Well that girl to your left is Celiac Disease. 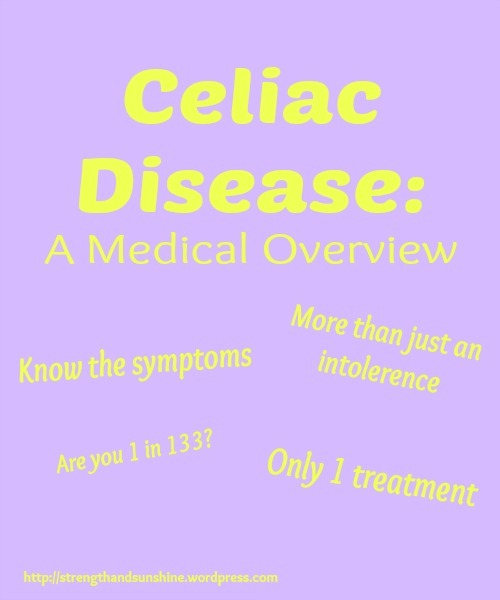 Diagnosing Celiac is so difficult because it mimics the symptoms of so many other diseases like irritable bowl syndrome, Crohn’s, intestinal infections, lactose intolerance, and even depression. Tests for Celiac are often rarely accurate and you have to be still eating a gluten-filled diet to get any positive results. The most common tests are blood tests which measure your total IgA, IgA-tTG, Iga-EMA, IgG/IgA-DGP, or IgG-AGA. These all measure your body’s response to gluten. If these results come back with positive results, you doctor will most likely call for an endoscopy to take a biopsy of the small intestine to confirm the diagnosis. However, you results may come back very ambiguous, but that does not mean you do not have Celiac. In this case you may want to start an elimination diet for a few weeks to see if your body begins to heal without any gluten in your system. Well, if you have Celiac Disease, the one any only treatment is a strict lifelong gluten-free diet. That means no gluten, no matter how small or in what form, must ever enter your body. You must avoid all forms of gluten which include the main 3: wheat, barley, and rye. But this also includes all of their derivatives like spelt, triticale, khorasan, farro, durum, modified food starch, and even contaminated oats. Any product that contains more than 20ppm of gluten is not safe, and even 20ppm can be too much for most Celiacs. But you are not deprived of all grains. There are so many alternatives including: rices, quinoa, buckwheat, corn, nut flours, amaranth, teff, etc. Plus you are still able to eat all fruits, veggies, clean meats, dairy, eggs, beans, and nuts. What about gluten intolerences and allergies? A gluten intolerance or allergy is not the same thing as Celiac Disease. They are both not autoimmune diseases, but other bodily reactions. An intolerance is when you experience the symptoms of Celiac, but lack the antibodies and intestinal damage seen with Celiac Disease. It is an innate immune response (not antigen specific) unlike Celiac which is an adaptive immune response. A gluten allergy (or more likely a wheat allergy) is exactly what is says, an allergy. It is an allergic reaction to foods containing wheat (usually not all gluten). Wheat is one of the top 8 allergens. It generates an allergy-causing antibody to the proteins found in wheat, but not just gluten. Symptoms will also include more “allergic type reactions” as seen in the other top 7 allergens. Including swelling or tightness of the throat, chest pain or tightness, difficulty breathing, trouble swallowing, pale/blue skin (lack of oxygen), dizziness or fainting, increased heartbeat. Essentially you will have an anaphylaxis reaction requiring immediate medical care and will need to carry an Epi-Pen. What are some final facts and figures I should know? About 1 in 133 Americans (1% of the population) have Celiac Disease. Of those, 83% are undiagnosed or misdiagnosed with other conditions. 6 to 10 years is the average time a person waits to be correctly diagnosed! 5-22% of those with Celiac have an immediate family member with the same condition. With an increase in education and awareness, it is estimated that the diagnosis rate may reach 50-60% by 2019. Sales in the gluten-free market are estimated to reach $5 billion by 2015. 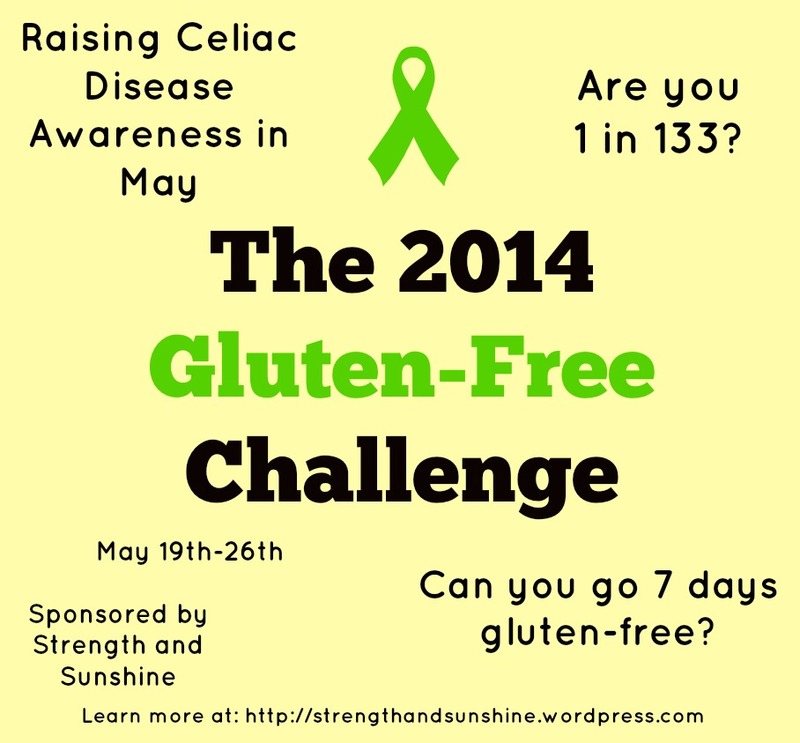 + Do you know someone with Celiac Disease? + Do you have any of these symptoms or think you are at risk? + How long did it take you to be diagnosed? T.G.I.F! O man, I am so happy this week is almost done! Ah, I am so worn out! 2 AP tests down, one today, and my last on will be on Tuesday. These tests are so incredibly dumb. They give you way to much time and I always end up sitting and staring at the wall or trying not to fall sleep for at least an hour on each section. Anyway, I am glad that Latin one is over…it was not fun, but not as horrible as I thought, just way to much time! I am so looking forward to the weekend and getting some work done, cooking! (finally! ), yoga yoga yoga, and just simply vegging out! Plus it is Mother’s, mom’s, mama’s, ma’s, mommy’s, mum’s, maternal parent’s Day on Sunday! I have some fun stuff planned…see below! 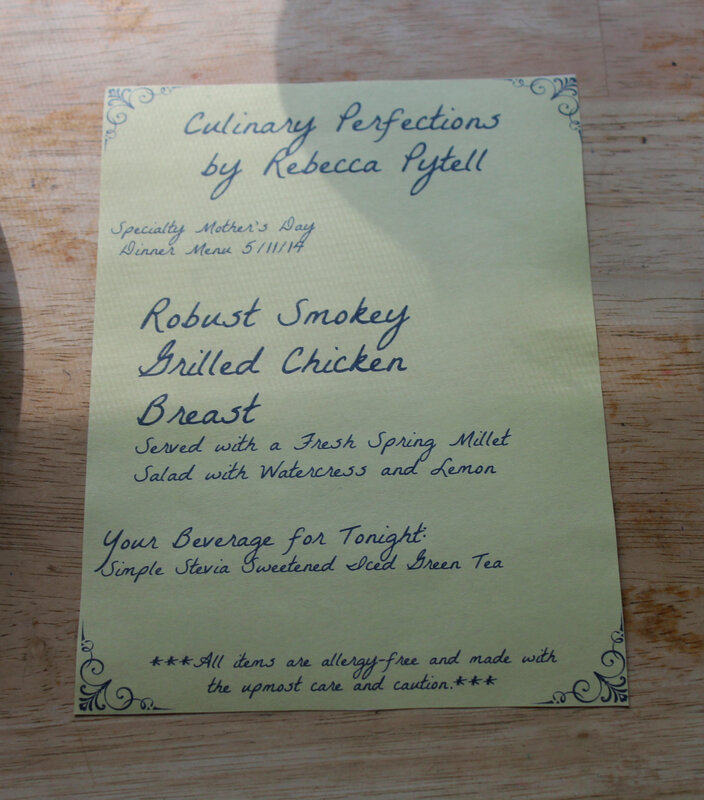 You are cordially invited on May 11th, 2014, to a formal dining experience at Culinary Perfections by Rebecca Pytell. You will have a fine-dining experience at this elegant yet cozy establishment. 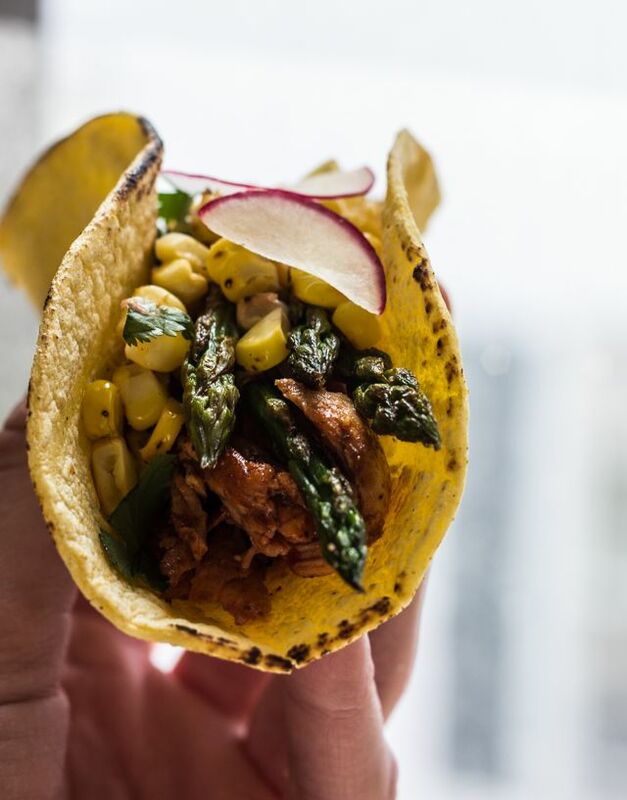 Dishes will feature fresh, wholesome, organic, and local ingredients all transformed on site into mouth-watering delicacies never before seen. We stick to strict cleanliness and food allergy standards to prevent any cross-contamination and so you can breathe-easy. We are having a special Mother’s Day service where you will be treated like a queen to thank you for all the loving, caring, and work you do. Your dinner will be provided free of charge, just sit back and enjoy the ambiance. Please arrive promptly at 5:10pm dressed in your Sunday finest. You will be seated at out most requested table with a special guest to share you dinner and night with. We can’t wait to have you at our establishment and provide you with dining experience you will never forget. Need some help with confidence and self-love? Read this post! What you say in your head can be majorly holding you back from success. Are you an “over fixer”? Can you just let things be? + What Are You Doing TO Your Body? It is not about “doing”, but what you do for your body! + Be Here. Right Now. Beautiful. Let the worries go and be present. Love this girl’s outlook! You should feel better and better about yourself as you get older! Confidence kids, that is what it’s all about! Do not give up! Do not give up! + Now we’re Questioning Encouragement? I love Cori’s response to this article and totally agree with her. This is a must read! + Ask A Yogini: What Does Vinyasa Mean? My favorite type of yoga. But Vinyasa also is a movement! + Picking The Right Running Shoe – Science Or Art Form? A running shoe is not just a pair of flip-flops. There are so many factors to consider. Now I hate NYC, but these just kill that feeling. Beautiful! This is what yoga is all about! Challenging yourself and celebrating small successes along the way. Read and learn all about the yoga bandhas! The evolution of a love for strength! + Compound Movements Mean EFFICIENT Workouts! Love the KB Swings! But Thrusters…o, they kill me! I have been making some major strides in new poses lately! And guess what? It is all on my own! Having a label to “hide” behind will not make you any better than anyone else. Just eat for yourself and your optimal health! Why can’t the kitchen just stay clean? Maybe because it is the most used room in the house…at least in my house. All about protein and guess what? You don’t need to eat meat! Why is that so hard for people to grasp? + Is Ibuprofen Causing Leaky Gut & Making Your Sick? Bad, bad, bad! I have not taken Advil or any of the like in years. + Is Stress Sabotaging Your Health And Fitness Goals? Stress is so bad. It affects your health in so many ways. Always encourage and help anyone who wants to get healthy! A completely honest and eye-opening post from Natalie. I have been slowly doing some more organizing of my huge recipe boards. There are just so many pins, it gets so overwhelming! Are you really picky with your product reviews? Do you fall victim to your own blog stats? + Should I Keep Blogging? Sometimes when ew step back from this crazy blogging world, we see what we are missing. But we always seem to get drawn right back in. O, this looks so lovely. Have you ever made your own lotion or cosmetics? 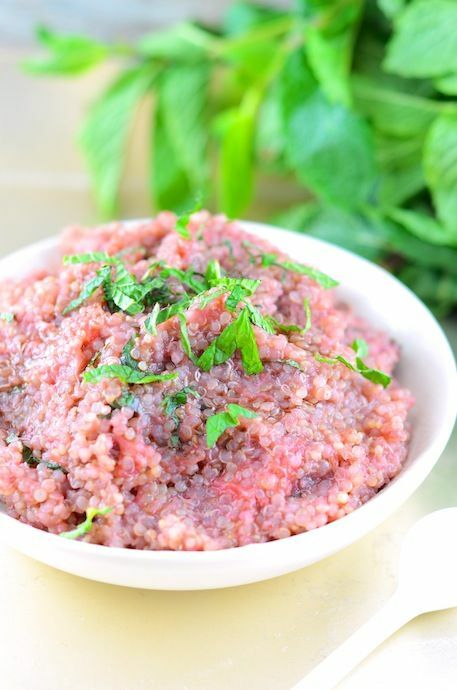 Strawberry Mint Quinoa. Okay, this looks absolutely amazing! So fresh and beautiful for spring! I love it, don’t you just want to dive right into that?! 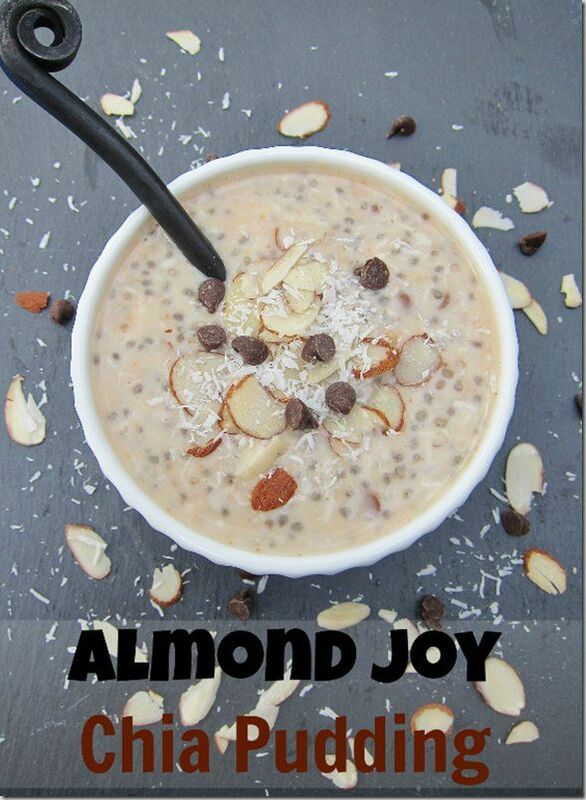 Almond Joy Chia Pudding. So I am not sure if I will ever get on the chia pudding bandwagon, but this recipe looks to good to pass up! 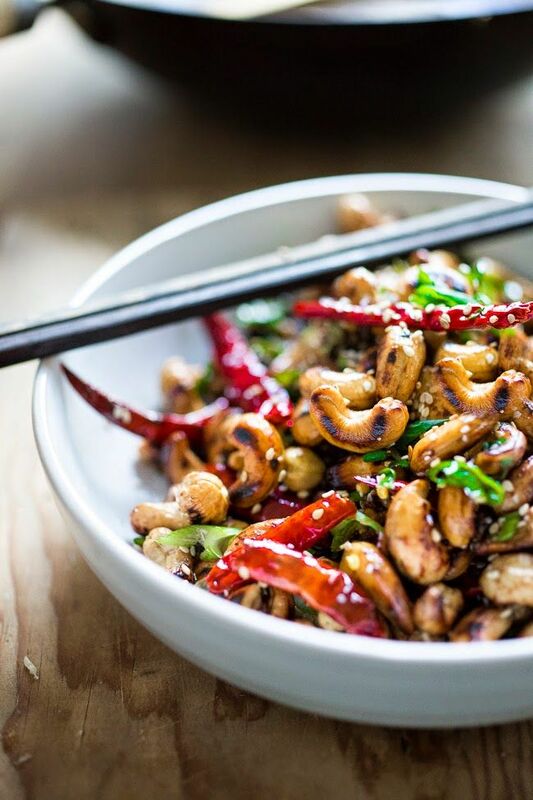 Wok-Seared Cashews with Scallions and Sesame. Cashews make my world go ’round. + Getting through AP Psych and AP Latin! + Some really awesome stuff will be happening with my job at Plant Fusion! We have tons of new ideas and things in the work. Once school is over I will be able to focus a lot more time and getting things together and I am so excited! 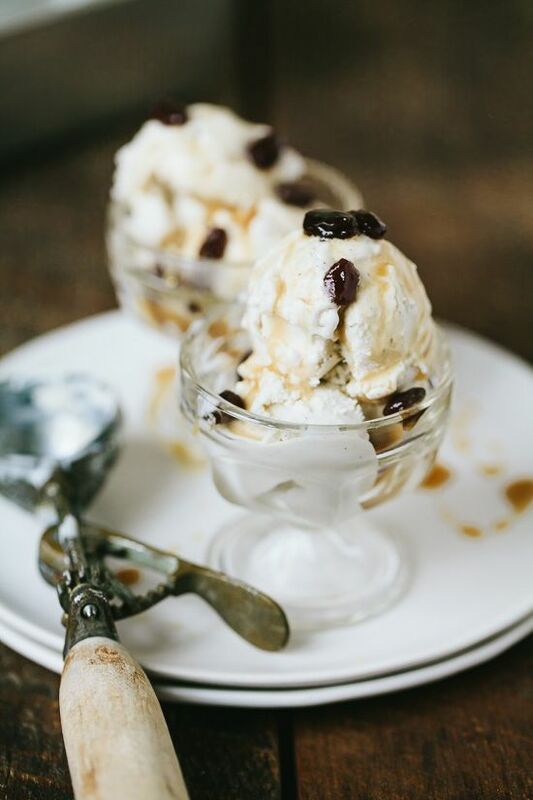 + I am so happy you all are liking the Gluten-Free Challenge and Gluten-Free posts! I have so many more great topics to discuss! Make sure you comment if you want to join in on the fun! + What do you love about you mom? + Planning any fun Mother’s Day shenanigans? Or are you a mom and hoping for something special? 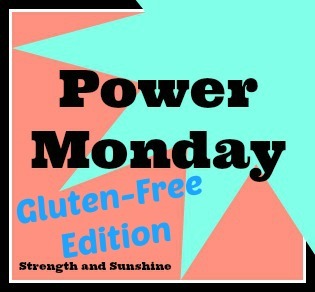 + Any specific topics you want me to cover for the Gluten-Free Challenge? Have a lovely weekend friends! Share it with loves ones, moms and all!